Home Casual Can You Beat the World’s Hardest Game? 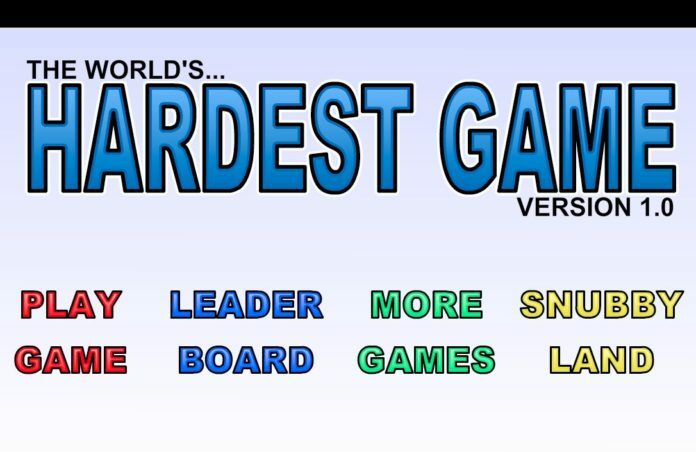 Can You Beat the World’s Hardest Game? World’s Hardest Game is a fitting classic title. It’s the perfect game for anyone who’s up for a relentlessly challenging solo adventure. Made nearly a decade ago, World’s Hardest Game is still a hit on the web and playable, for instance, on the Poki platform. There have been three sequels, but none completely capture the highly effective simplicity of the original. When starting the World’s Hardest Game, players receive the following warning: “It is harder than any game you have ever played, or ever will play.” Unfortunately, that bold statement is not hyperbole. There are 30 different levels, all of which are difficult. Even the first level could require more than a dozen attempts until victory. In most level-based games, each new level is more challenging than the last. That isn’t always the case in World’s Hardest Game. Some levels look intimidating, but they could be slightly easier than the previous one. For the record, “slightly easier” doesn’t mean easy; all 30 levels present major difficulties. Before each level, players can expect unhelpful tips. A few classics are “You don’t know what you’re getting into,” “Don’t even bother trying,” and “This one is so hard you’ll never do it.” Useful information and kind-hearted inspiration is out the window. There are myriad traps, but only one type of obstacle: blue circles. In every level, players control a red square (see also this video from Markiplier). If the square touches any of the blue circles, death will occur. The red square is slightly larger than the circles, making it harder to stay alive in tight corners. There are also yellow circles to collect before finishing each level. In certain rounds, the yellow circles are in hard-to-reach spots. Other levels might house conveniently placed yellows. If a yellow circle is in a seemingly easy position, it’s probably because the blue circles are extra troubling. 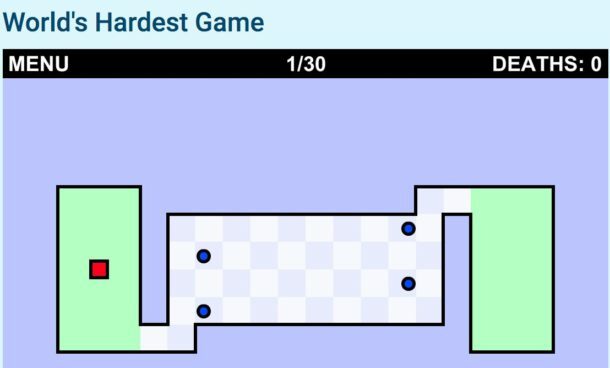 There are no easy levels in World’s Hardest Game, and that’s important to remember. If something looks simple, it’s too good to be true. The final goal in each level is the same: go to the green beacon. Of course, that’s much easier said than done. Every maze requires excellent timing and sharp reflexes. In the first round, four blue circles bounce back and forth across the middle of the maze. Players must move above and below the circles at a rapid pace, inching towards the exit during safe breaks. The second maze features a similar challenge; instead of moving left and right, the blue circles bounce up and down. The third maze is completely different. The arena is very small, and one yellow circle resides in a particularly inconvenient corner. Players must wait for the right moment to sneak through a seemingly impenetrable blue wall. After collecting the yellow dot, brave gamers must jet through the blue wall again. There are 27 other mazes in World’s Hardest Game, many of which are quite complicated and loaded with traps. Let the name of the game serve as a warning: World’s Hardest Game isn’t easy.